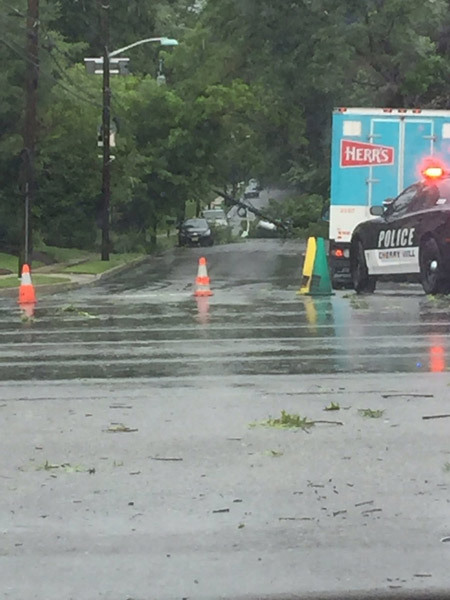 A tree brought wires down onto a car in Lansdowne, Pa. Action News viewer Jim Carr sent in this photo. 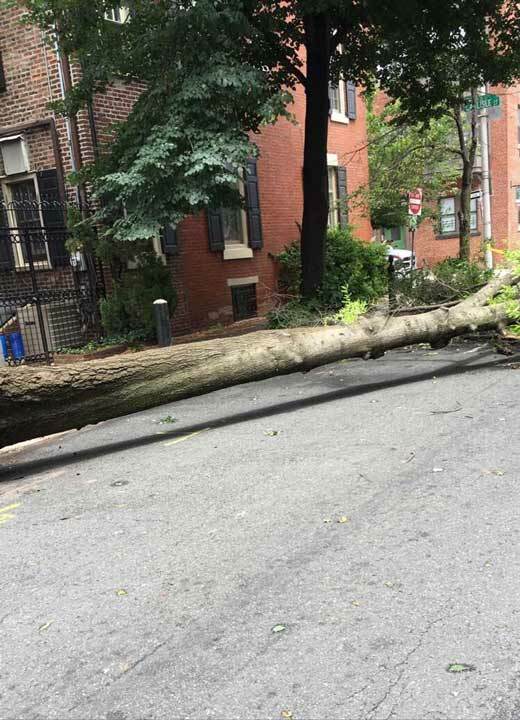 PHILADELPHIA (WPVI) -- A fast-moving storm knocked down trees and power lines, leaving thousands without power across the region Wednesday. 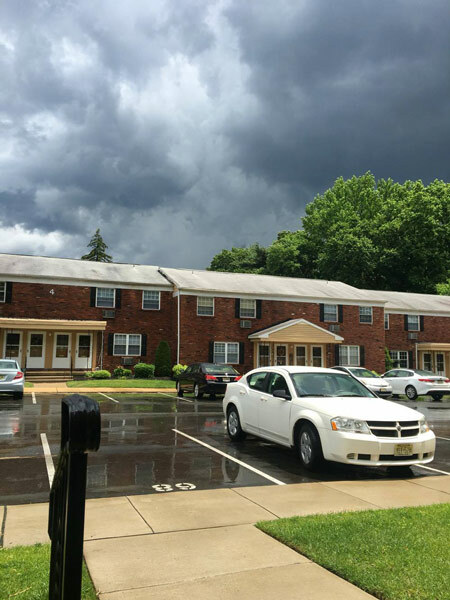 Action News viewer sent in this photo of the storm in Maple Shade, NJ. 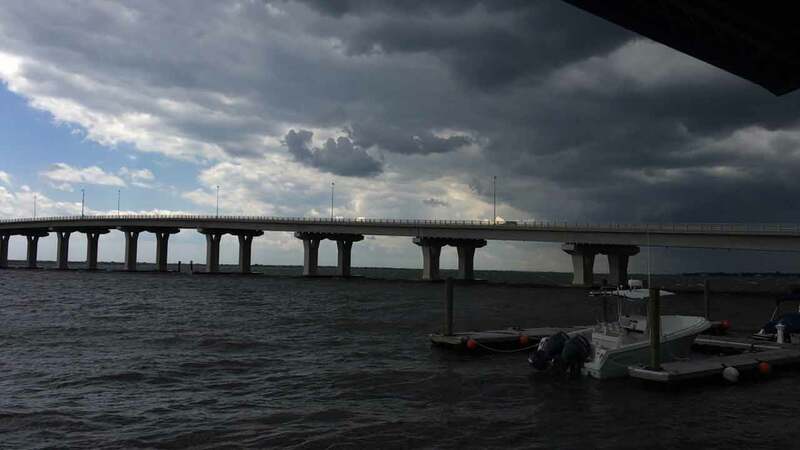 Action News viewer Jamie Fiorillo sent in this photo of the storm clouds above the 9th Street Bridge in Somers Point, NJ. 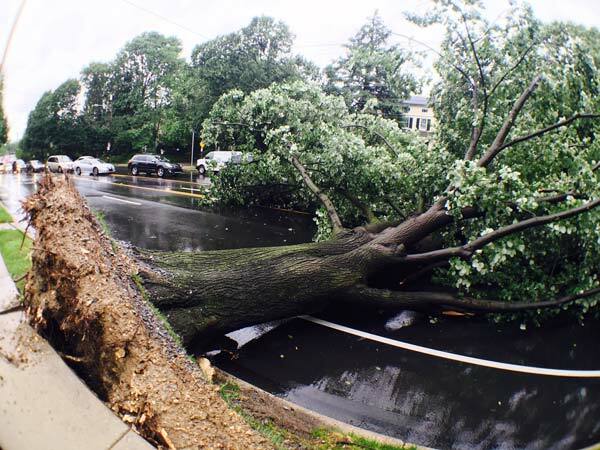 Action News viewer Danielle sent in photos of a tree that fell onto a car on the 7100 block of Whitaker Avenue in Northeast Philadelphia. 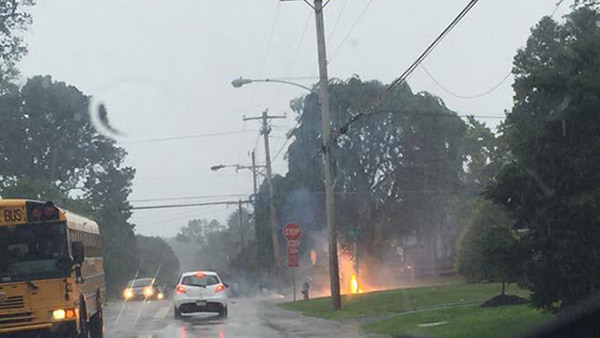 Action News viewer Kevin Varady sent in this photo of downed power lines in Havertown, Pa.
A fast-moving storm knocked down trees and power lines, leaving thousands without power across the region Wednesday. Six Flags Great Adventure was among the businesses that lost power. In a statement, Six Flags Great Adventure says the power is out in Jackson Township, New Jersey, including at the park. "Everyone is safe and no one was injured, one ride was unloaded (indoor ride). All the other rides had already been closed due to weather," the statement read. Crews worked to rescue a woman inside the car. 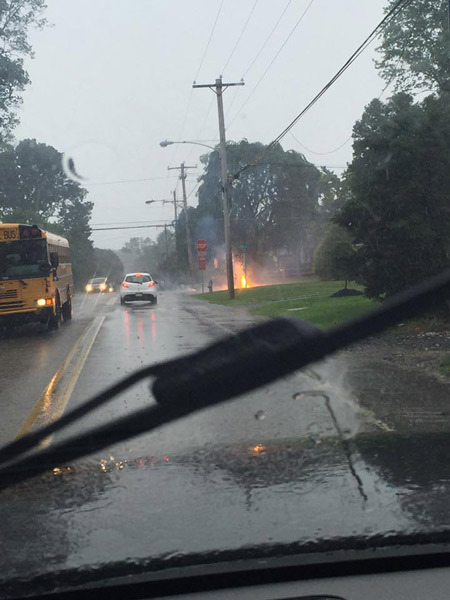 The storm, which came through late Wednesday morning to early afternoon, saw power lines and trees fall to the ground. Parts of South Jersey were particularly hard hit. Strong winds sent a tree crashing into Jeannette Blake's car on Federal Street in Camden. She was inside, but somehow emerged without a scratch. 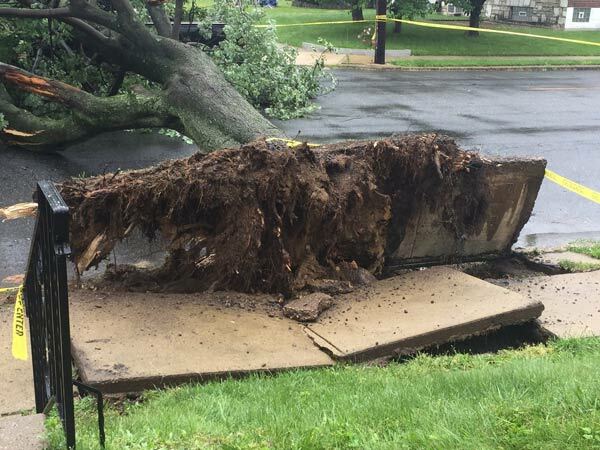 Storm caused massive damage in Palmyra, N.J. 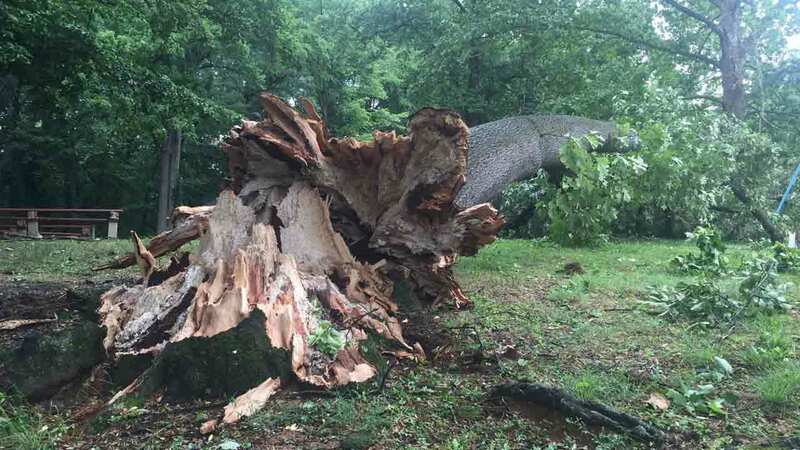 In Springfield, Delaware County, a number of larges tree fell. One of them came crashing down onto Kara Giuffrida's car while she and her children were waiting at a red light. "It was just a loud crash on top of my car and then glass broke on the left-hand side. I just wanted my kids to be OK and they're OK, thank God," Giuffrida said. 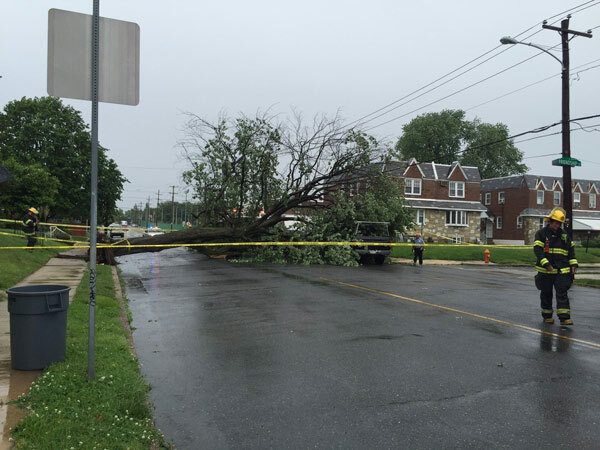 Storm caused damage in Delaware County. Not far from there, another huge tree uprooted, hitting a house on Locust Street. 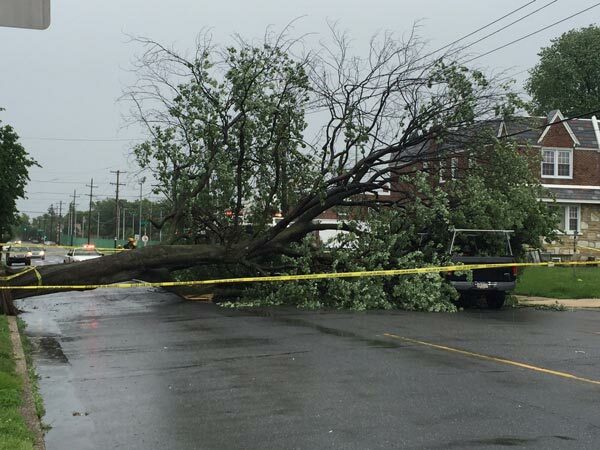 Springfield, Delaware County felt the effects of Wednesday's storm. 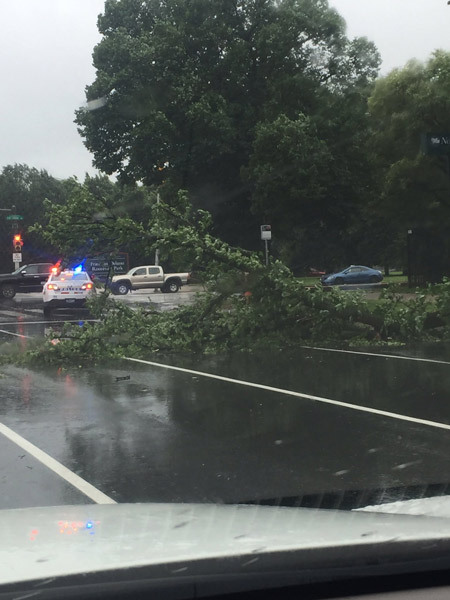 In Wilmington, Delaware, a tree fell onto a car on Thompson Station Road and Brandywine Creek Road around 11:30 a.m. 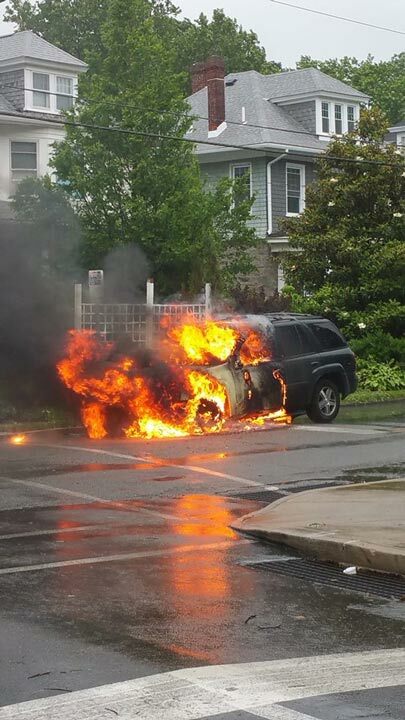 Arriving paramedics found a 32-year-old woman trapped inside the car. The Talleyville Fire Company worked for 15 minutes to rescue the woman. 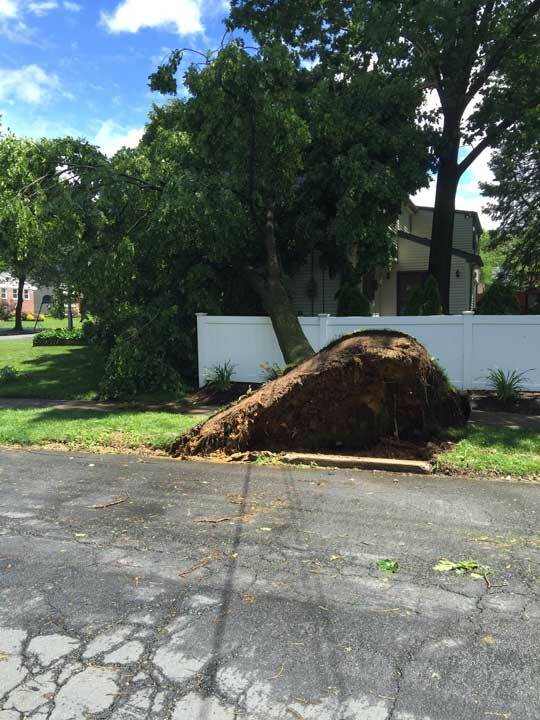 A tree fell onto a home in Cinnaminson, New Jersey. She was taken to Christiana Hospital in stable condition. 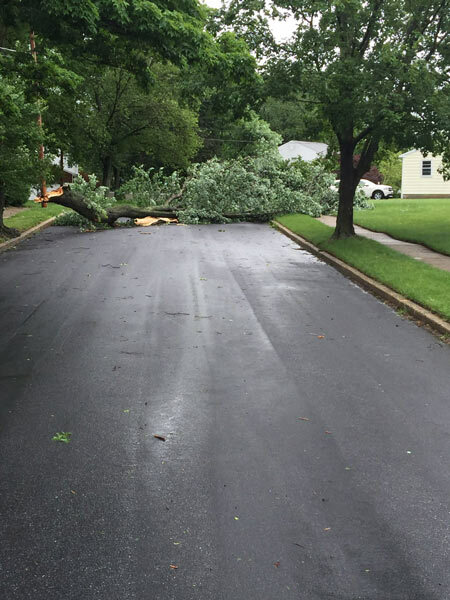 Action News photographer Dan Sheridan captured a large tree down on Ridge Avenue by Manatawna. Action News sports reporter Jamie Apody says the storm was causing some trouble at an Eagles practice. " Team moved inside for today," she said. The storm brought thunder, winds, heavy rains and even hail. 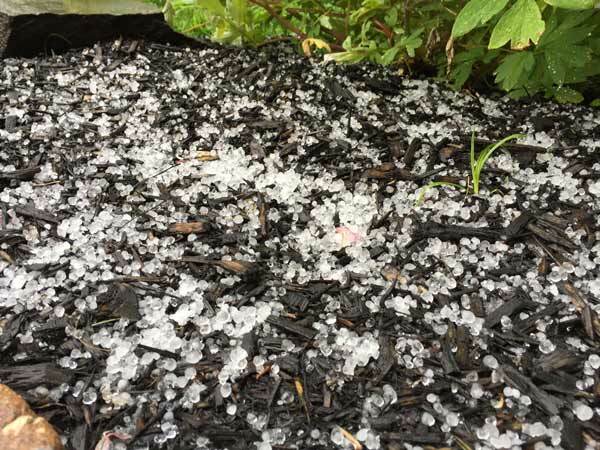 Action News viewer Kristen Lynn Lucas sent in this photo of hail from New Britain Township, Pa.
A large tent at Water Works in Center City was taken out by the storm. 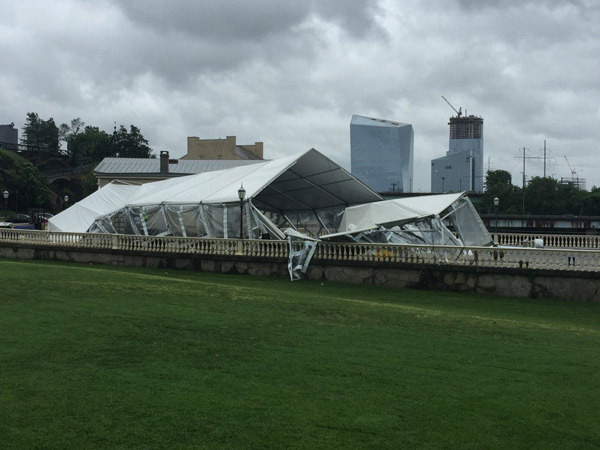 Action News photographer Richard Lacovara captured the scene as workers, who were setting up the tent, had to run for cover. SEPTA suspended service on the Chestnut Hill West and Trenton lines due to Amtrak's downed wires. Both lines have resumed service. Chestnut Hill West: Service has resumed. Train #9837 is the first outbound train to Chestnut Hill West. Expect delays of up to 15 minutes. New Jersey Transit suspended RiverLINE service both ways between the Pennsauken Transit Center and Rt. 73 Pennsauken due to a downed tree blocking the tracks for an hour Wednesday afternoon. The Philadelphia International Airport reports departures were running an average 59 minutes late due to storms. Check flight status with your carrier. PHL getting hammered right now with heavy rain and wind. Expect impacts to flight ops. Check with your carrier.